AVP is a new company with old genes. A spinoff from Adaptive Microware, AVP's mission is to be center stage in the modern broadcast foodchain. That means transmission, but it also means post production. The driving forces behind these new products are ease of use and cost-effectiveness. We are aiming to deliver much more "bang for the buck" than any competitive solution in our field. AXE-2000 uses intelligent scene analysis, adaptive decision logic and non-linear quantization to achieve excellent quality video, even with multiple video programs and challenging bandwidth constraints. This provides great looking images on your highest priority channels giving you highly adaptable access to quality streams in line with your revenue prioritisations. This highly sophisticated yet easy-to-use ingest tool is designed to help post prodcution houses face the data mountain being brought into their rooms by producers. Its on-the-fly annotations, small form factor and modest power requirements have already found favor with a major post-production house. Easy to use? Certainly - but it's no lightweight. Historically, shooting ratios have been anything from 12-20:1 for each hour transmitted. Now, in the Brave New World of high density data acquisition - e.g. the Observational Documentary - Producers are routinely expecting Post Production Houses to deal with ratios of up 1000:1! 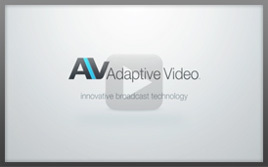 The Adaptive Video NVE-2000 is a Network Routable Ingest Encoder designed to meet this challenge head on.